I am a bit of a subscription box junkie; I enjoy any boxes from books to sticker or beauty boxes. 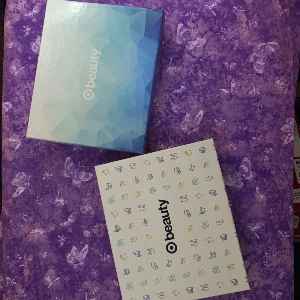 I have tried a few beauty boxes and the Target Beauty Box is my absolute favorite and I wanted to share a little bit about it. Target's box is a monthly non-subscription box that is 7.00 USD with free shipping. Target occasionally does additional boxes around the holidays, or does boxes with certain items (e.g. face masks or dry shampoo only) which typically cost between 14.00-20.00 USD. This box does not ship internationally, to my knowledge. It comes with five to seven items that are sample, deluxe, or even full size. Makeup, hair products, or other "beauty" products are often included. The box also includes many coupons for store use and a sheet that explains what each item is used for. I especially like this part because I have had makeup boxes (with unfamiliar brands) that are not really helpful in noting the way the products should be used. I do not have a Target store within reasonable distance so I do not use the coupons, but I would if I did have a Target nearby. This box used to debut on the first of each month, but has since come out later. It tends to come out within the first week of each month but you often have to check back several times. Target shows images and gives a description of what is in the box. This box is not a subscription box, which has its advantages and disadvantages. Since it is not a subscription, people have the option of not purchasing one if they do not like what is included. However, it often sells out quickly and that can be frustrating for many people. Though I have not purchased every month, I have received a good amount of boxes over the years and I always thoroughly enjoy them. My boxes have never been damaged and have always been packaged nicely. The price is also great and it is another reason why I like this box so much. I like the ability to try different products without breaking the bank. 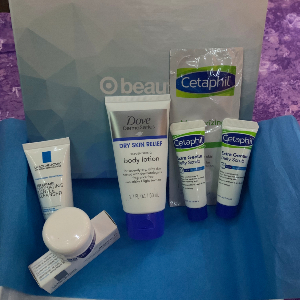 I typically only get one box a month but there were certain products I wanted to try in each one. Some of these brands are brands that I have had a chance to try. I have tried the Love Beauty & Planet shampoo and conditioner but have not tried the deodorant which is a new product. I have tried some products from Schmidt's, too, but I am interested in trying the charcoal toothpaste. I was particularly excited about the Dove in the skin care box as I really love anything by Dove. Garnier hair products work well for my curly hair, but I haven't tried the makeup remover before. I noticed that I got two facial scrub samples and it appears as though it was a mistake or a substitute for another item that was out of stock. I do occasionally purchase the full size items after trying them (such as hair products and deodorants). If there is anything I won't use or anything that I know will irritate my skin, I give it to someone or donate it to charities for someone who may like it. I enjoy the chance to try different items and getting the box shipped to my door most months. I keep a stash of beauty box items to eventually use, and I don't think I will need to buy shampoo or conditioner for a long time! The low price, the ability to easily skip months, and the quality of the items are what make this my favorite beauty box thus far. I hope to purchase this box for a long time. If you want to try new things or treat yourself for a low price, I highly recommend trying the Target Beauty Box.